I hope you’re having a great Christmas!. 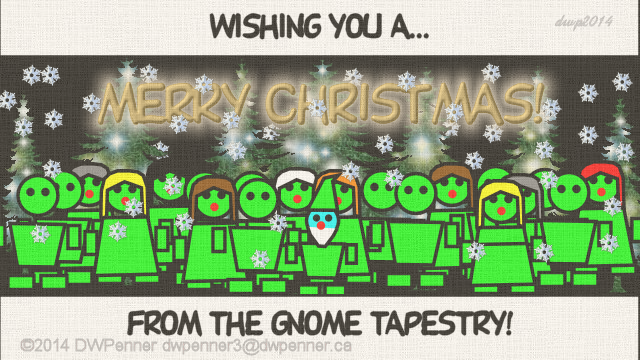 This entry was posted in Cartoon Strips, Gnomestead Tapestry, Special, Specials, Writer's Words and tagged Cartoon, Cartoon Strip, celebrate, Christmas, Christmas 2015, Comic, Comic Strip, Darrell W Penner, DWP, DWPenner, Giving, Gnome, Gnome Tapestry, Gnomestead Tapestries, Gnomestead Tapestry, Gnorman, Gnorman the Gnome, Happy Holidays, Merry Christmas!, Tales, Tapestry, Tapistry, Writer's Words by DWPenner. Bookmark the permalink.